DJI Inspire 2 Hands-On Review. The Best Drone For Professional Use? DJI Inspire 2 Hands-On Review. Is This Drone The Most Professional One? This is Andrew from djibestdrones.com and today I’m going to review the DJI Inspire 2. The DJI Inspire 2 is the first drone with an inbuilt camera that records videos at 5.2K in cinema DNG RAW and for safety purposes you can record on to an SSD card and microSD card at the very same time. 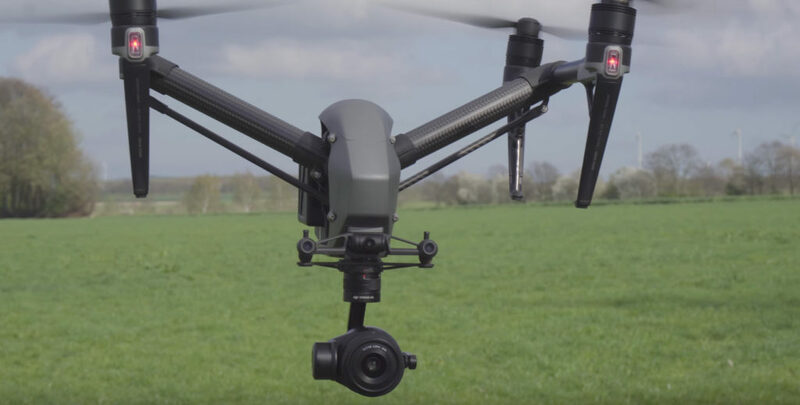 Of course you can record standard 4k footage with up to 100 megabytes per second but there is more: pilots can now choose whether they want to compress their footage using h.264 or h.265 and with the Inspire 2 you can use all kinds of micro 4/3 lenses with various focal lengths. Professionals can broadcast their footage in HD or even Full HD while every user can stream live to Facebook YouTube and other platforms. But not only the camera system has been redesigned: the DJI Inspire 2 is safer than ever. It comes with obstacle avoidance sensors with a maximum range of up to 30 meters. The bulletproof vision positioning system (VPS) that allows precise hovering even indoors. The drone has an all-new dual battery design and talking about batteries: that flight time read from the specs will allow you to stay airborne for up to 27 minutes while the range variety 5 kilometers (3 miles) in Europe and 7 kilometers (4,3 miles) in America. The DJI Go app offers a tall intelligent flight modes in-depth which are easy to understand and use menus. And if you have the money you can purchase accessories that will change the way you fly drones. Crystal sky – the all-new monitors for the DJI Inspire to allow you to use the displays even in the brightest surroundings without a Sun hood. Okay, before we lionize the Inspire – only for its tech specs, we want to find out more about the pros and cons as every metal has two sides. Before I talk about the camera and some other important parts of the new drone let me cover some interesting basics that you should be aware of – the included case measure 60 by 55 by 25 centimeters (23x21x9,8 inches) and can therefore be transported on a plane still. And maybe the only real advantage of the case – I did transport the case on three or four flights yet and it was not at all damage – and the drone was safe at all times. On the downside one can say that the case handling is pretty unusual and sometimes seems as if the designer don’t know what retired at work not only are the top and bottom parts loose and not connected but the knot gum top handle is situated upside-down which leads to some confusion when laying the case down. Next to that the closures sit pretty tight and opening and closing them can sometimes take in extra minutes. Okay let’s move on. Once cleared for takeoff with two batteries for propellers and the x5 s camera attached to it the DJI Inspire 2 weight is 6,6 lbs (3.9 kg) and it measures 73 by 69 by 32 centimeters (28,7x27x12,5 inches). 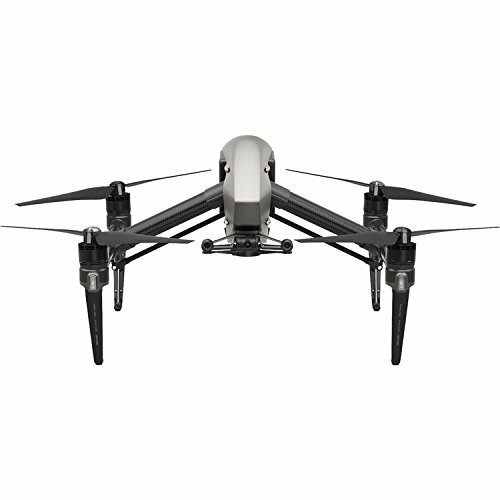 Even though the measurement will change once the drone enters the travel or transportation mode the body is made out of a very durable medium aluminum material while the arms are made out of super lightweight carbon fiber. All cables are protected by mats which is not an industry standard and I really like that the microSD card can now be inserted directly into the drones body and not into the camera anymore. One con though: the body is neither water nor splash proof – you can probably fly it in a light rain shower though, but I really would not recommend it. I would rather take a Phantom 4 Pro for that purpose if I had to. When taking a closer look at the details we immediately notice that next to the main camera there is another small camera installed to the Inspire 2. 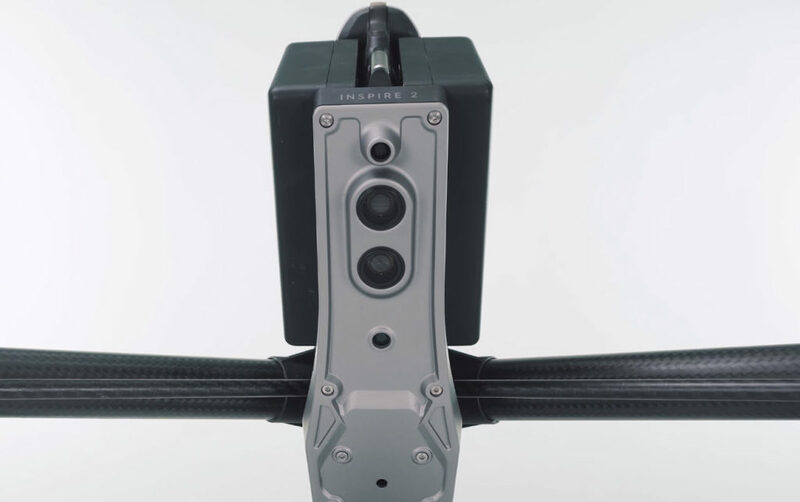 This FPV camera was designed for flying in dwell operator mode meaning that one pilot controls the drone while the other one moves the camera. Sometimes flying is tough if you don’t know its directions as the camera might not be pointing to the front and that is the moment when having an FPV camera does not only raise the comfort but ensure the safer flight. 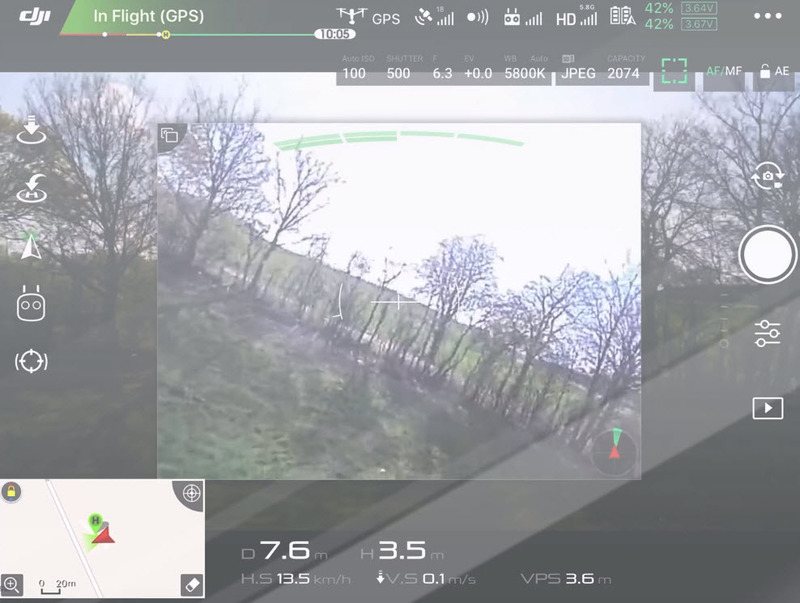 The FPV camera does the job even though it is pretty unstable and the drone operator will need to get used to it but after two or three flights you will feel comfortable with the FPV camera and it will raise the level of safety. At the right and left of the FPV camera we find two more cameras: the DJI Inspire 2 obstacle avoidance system with a maximum frontal range of 30 meters (98 feet). The system can be really helpful even though you should know that it works at daytime only as the cameras need enough light to operate safely. The system works until a top speed of up to 54 km/h as it’s higher than that might not allow the drone to come to rest before hitting an obstacle as the braking distance could be too long. The obstacle avoidance sensors can be really helpful even for experts as in the case of a return to home, meaning that once the signal gets lost and the drone autonomously travels to the takeoff destination, the sensors avoid hitting obstacles if there is a tree or a house or another object in the way while the pilot cannot control the drone. The Inspire 2 drone will run around and have a safe travel back. Unfortunately, we are missing side and back sensors but and that is big news. 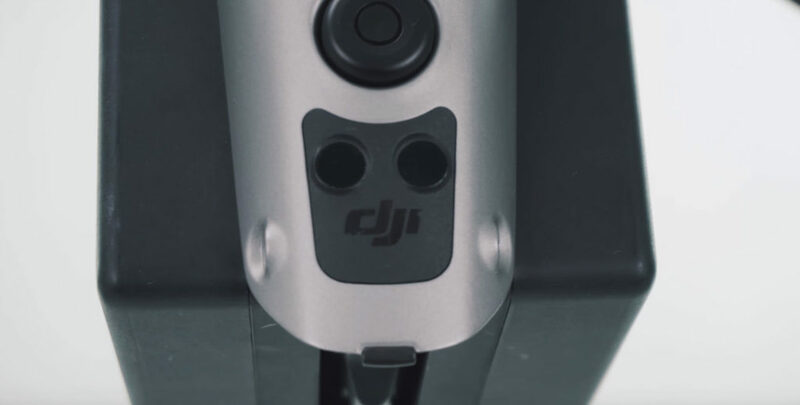 The DJI Inspire 2 is the first drone that is equipped with top sensors as well: the two black dots can spot the ceiling or other obstacles up to a maximum range of 5 meters (16 feet). Indoor flying has never been that safe before. At the bottom we find a combination of cameras and sonar sensors – together they make the GPS vision positioning system. It keeps the drone in place and let it hover very precisely especially when flying lower to the ground. It works without a satellite signal which makes it a great tool for indoor flights. VPS works until the height of up to 10 meters (32 feet) as mentioned before. The DJI Inspire 2’s body is equipped with a dual IMU and a barometer for the extra bit of safety that you might need in case of an emergency. The redundancy components add a new level of safety to the Inspire series that I really appreciate. But before we get lost talking about sensors and cameras let’s talk about batteries as battery life and safety really make a difference in the drone industry. The DJI Inspire 2 needs to be equipped with at least 2 batteries. Every battery has a capacity of 4,280mAh which times 2 makes 8560mAh flight and that’s a whole lot of power. Both batteries features small LED indicators to always show the current power level without the need of taking a look at the screen. Both batteries need to be at approximately the same voltage: this means that flying with one fully charged and one half charged battery is not possible. With two fully charge batteries and the heavier x5s camera I measured an average flight time of approximately 22 to 23 minutes. When lowering the power from 100 to 15% charging two batteries took an average of about 1.5 hours. 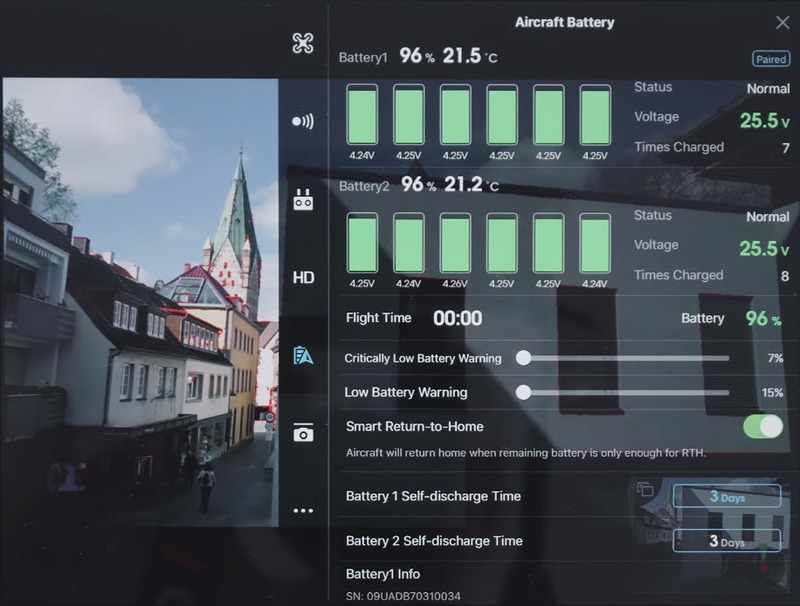 But there is more: the DJI Inspire 2 intelligent flight batteries probably are the safest drone batteries available on the market – they not only offer plenty safety options (most of them even work automatically as the smart return to home that tells you when to return home based on how far you are away from the takeoff position) but you can set up the self-discharging time manually and you can check all kinds of settings from the current voltage, the leftover capacity in minutes or percentages or you could find out how many times each battery was charged before. All of that is cool and DJI is a leader when it comes to battery safety, we all know that, but how about any new inventions? The engineers at DJI came up with something really smart and really new: in the wintertime most drone crashes are dedicated to battery failures. Often pilots insert cold batteries as they don’t want to heat them up manually before the flight and they immediately fly at full speed and – crash happens. The intelligent flight batteries of the DJI Inspire feature an integrated heating system that allow the usage at temperatures of negative 20 degrees Celsius or negative 4 degrees Fahrenheit and that’s amazing. There is one big con to the batteries as well though: in my eyes they’re too expensive – check out the current pricing of the single battery by here. The pricing might have changed but investing approximately two times $200 would make $400 for one single flight. It is massive and too much for most users. I measured the top speeds under the same conditions in P mode with obstacle avoidance and P mode without obstacle avoidance and in sport mode. The top speeds are impressive especially because the braking distance is actually not very long not even in sport mode which raises the level of safety. Let’s now talk about the kingmaker – the camera. There’s not only a single camera available: you can choose between the cheaper DJI Zenmuse X4s and the more professional DJI Zenmuse X5s camera. I will not cover the Zenmuse X4s as it seems to be somewhat useless to me as I could simply work with a cheaper DJI Phantom 4 Pro or Pro V2 and achieve the very same results. Let’s focus on the DJI Zenmuse X5s camera with which you can record footage at up to 5.2K with up to 29.97 frames per second in real cinema DNG RAW at up to 4.4 gigabytes per second. Let’s cover the most important non RAW format as well. You can film in 4k at a maximum of 100 megabytes per second with up to 29.97 frames per second and at FullHD (1080p) which the Inspire 2 records at maximum 100 megabytes per second when using the highest frame rate available which is 100. Operators who want to film in 5.2K raw need to purchase a separate DJI SSD and card reader though please note that the SSDs with a smaller capacity cannot be used for raw 5.2K filming which is kind of a hassle. You need at least a 480 gigabyte SSD minimum to get started; once inserted you’re not done – DJI wants it all – they charge you another $1,300 for a license key and honestly said that is too much to most private users and even to some smaller businesses. But with the license key that also includes Apple ProRes and the SSD plus the reader you are finally prepared and can start filming incredibly sharp footage and being able to set the white balance and post and having all other advantages of raw footage. Check it out some more facts about the Zenmuse X5s filming capabilities: you can of course set things up manually or you can choose the auto mode or shutter or aperture priority mode. The ISO can be set onto 100 minimum and 6400 maximum and a short word on the photography skills of the Zenmuse X5s DJI sets a new standard in the aerial photography as well: you can choose between 4:3 ratio or you can choose 16:9 photos at 5,280×2970 while the camera gives you a nice and sharp twenty point eight megapixels. And of course you can record JPEG and DNG RAW photos at the very same time and you will find all kinds of cool photo functions installed as: single shot first, shooting with up to frames auto exposure bracketing, time-lapse shooting and if you’re using an SD card you can even use the robbers shooting mode which is pretty cool. The ISO in photography mode can be set up to values ranging from 100 till 25,600. I noticed that the X5s camera was a lot more stable than for example the older X5 camera of the DJI Inspire 1 Pro. They technically both allow you to use, for example, of 45 millimeters lens but while the image looked pretty shaky ones – wind came up – at the X5 except when intensively working on balancing both camera and lens the new X5s handled the 45 millimeters with ease. This might not sound spectacular but to me it is one of the greatest advantages of the new camera and one of the main reasons why I bought it. Still, the Inspire 2 behaves amazingly in the wind and I was even flying with the 25 millimeters lenses – so pretty close – and it wasn’t shaky at all and everything was super stable, even though I got a warning “high wind velocity” and stuff. The Inspire 1, the new DJI Phantom 4 Pro – they cannot really compare to the stability of the Inspire 2 it’s just amazing. Every pilot who has suffered from a data loss will love the DJI Inspire 2 – as the footage can be recorded on both the SSD and microSD card at the very same time you could even record 5.2K on to the SSD while recording in 4k onto the microSD card and, finally, let me mention that the DJI Inspire 2 with X5s camera can easily be used as a professional handheld camera! And even though the z-axis cannot be stabilized that way the footage looks amazing and mixing both aerials and ground footage has never been easier. I could right now cover all intelligent slide functions of the DJI Inspire 2 but there are too many of them it would take another hour talking about all of them. All I can say is that there are plenty cool and there is one more mode that I want to briefly introduce you into because that mode is really incredible especially when working with higher focal length lenses and the DJI Inspire 2 very smart algorithms allow every operator to shoot highly professional aerials while you take care of the basic slide controls. Both camera and drone automatically creates cinematic shots – no second remote controller required, no GPS transmitters needed as the tracking is camera based. No more worrying about getting the shot done especially when using higher focal length lenses. This mode is incredible. Again, I would rather want to buy an SSD with less storage for less money and just moves the data to a hard drive more often. The list continues with missing side and back obstacle avoidance sensors and ends with the fact that having a dual battery system is great but if a single battery costs you $200 then I need to say that again – the pricing is an issue. the ceiling sensors that let you fly indoors more safely and the total range of either 3 miles in Europe or 4,3 miles in the USA is amazing even though not really needed but the signal is strong and wherever I flew I never had any transmission problems. The last thing is especially cool if you’re thinking of for example like broadcasting or live-streaming the front FPV camera together with a dual operator setup it’s another great advantage that raises the safety on the one hand and it allows you to fly pro maneuvers on the other hand. If you look at the pros and cons again you will see that there are tons of advantages while the actual main disadvantage is the pricing. My recommendation: if you are professional or if you’re having a bigger budget just go for it you won’t regret it if you’re not having the budget and 4k is enough you might want to check the Phantom 4 Pro. This site participates in the Amazon Services LLC Associates Program.